Source for text: Martin Luther, “Preface to the Complete Edition of Luther’s Latin Works (1545”, trans. By Bro. Andrew Thornton, OSB, “Vorrede zu Band I der Opera Latina der Wittenberger Ausgabe. 1545″ in vol. 4 of _Luthers Werke in Auswahl_, ed. Otto Clemen, 6th ed.,(Berlin: de Gruyter. 1967). pp. 421-428. http://www.projectwittenberg.org/. 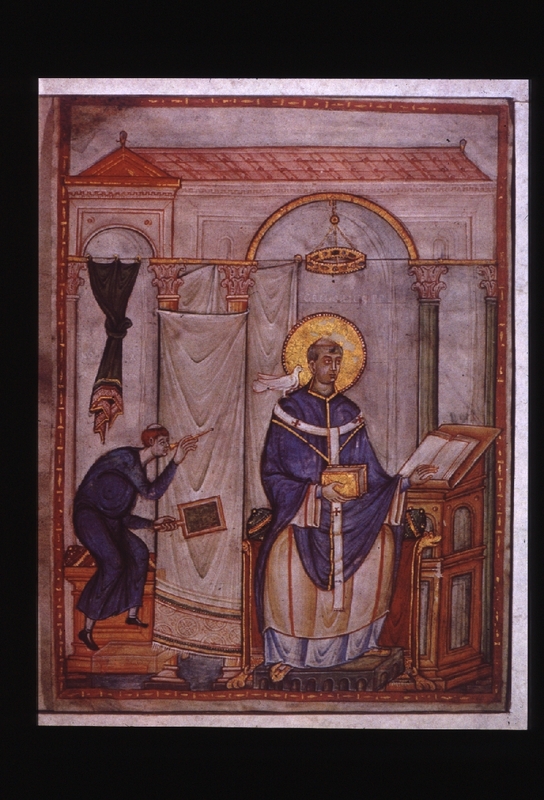 Source for visual: Pope Gregory the Great with dove, Germany, c. 983-7, From the Collection of Joan Cadden, History Project at University of California, Davis Marchand Archive, http://historyproject.ucdavis.edu/ic/image_details.php?id=10750lStadtbibliothek, Palais Walderdorff, Domfreihof 1b, 54290 Trier, GERMANY. Online at http://www.stadtbibliothek-trier.de. In George Zarnecki, “Art of the Medieval World: Architecture, Sculpture, Painting, The Sacred Arts,” (Copyright © Abrams, 115 W 18th St, 6th Fl, New York, NY 10011) 1975, color pl. 27. All rights reserved.